Looking younger is a centuries old quest. From looking for the Fountain of Youth to buying beauty products and having cosmetic surgeries, beauty and looking younger is a billion dollar a year industry. We are constantly searching for something to make us look younger. I received RENU Advanced to facilitate my review… no other compensation was received. This is my opinion, based on my results and may differ from yours. As a woman in my early fifties, I am among one of those people (because many men want to look younger, too) I mentioned above that want to look younger. At least look my best. Since I don’t want to have cosmetic surgery, not just because of the cost, but I’d rather not be sedated or cut on, and I don’t like needles; I’ll just opt for good skincare and beauty products. For the past month I’ve been using RENU Advanced skin care system. 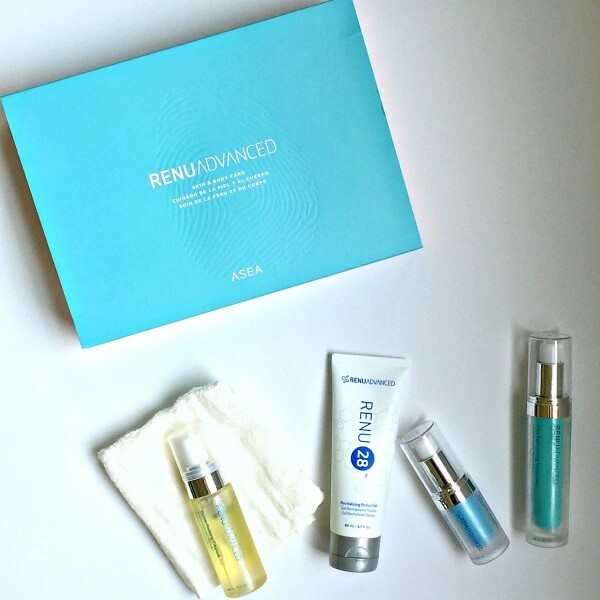 I’ve not been so excited about skincare products in a long time as I am RENU Advanced. When we are younger our skin renews itself constantly. However, as we age renewal of healthy cells slows down dramatically. This is why we start seeing lines and wrinkles when we look in the mirror. It doesn’t have to be that way, though. With RENU Advanced you can get your youthful, beautiful skin back with RENU Advanced, the first and ONLY redox anti-aging face care system. Without redox signaling molecules, skin cells can’t communicate. ASEA’s patented redox signaling technology has been clinically proven to benefit cell communication and renewal for a healthy, youthful appearance. Gentle Refining Cleanser – is a rich foaming cleanser that tones and hydrates your skin as it gently washes away dirt, oil, and impurities all the while leaving skin looking and feeling younger. Specifically formulated to support redox signaling technology. 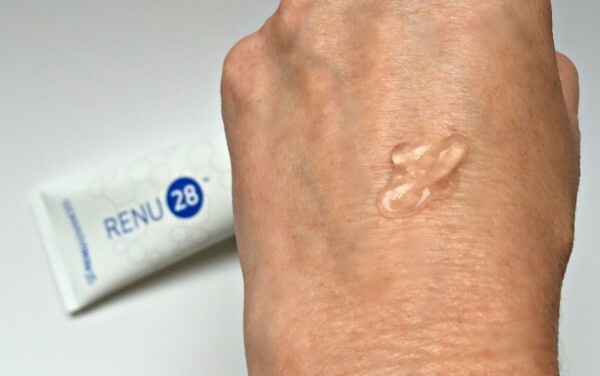 RENU 28 Revitalizing Redox Gel – holds the power of redox signaling technology in a light, fast-absorbing gel designed to support healthy cell renewal. This whole-body skin therapy works to add smoothness, even texture, and revitalize skin health. Intensive Redox Serum – is an ultra-concentrated anti-aging skin therapy designed to revitalize and support skin renewal. With powerfully acting redox signaling molecules, this facial serum targets even the most challenging imperfections associated with aging. Like my crows feet. 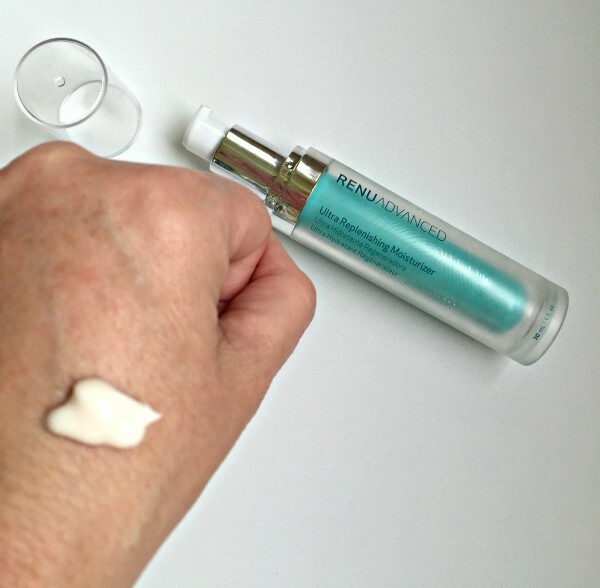 Ultra Replenishing Moisturizer – this benefit-packed moisturizer delivers deep hydration and anti-aging actives for a visibly youthful, vibrant appearance. Specifically formulated to support redox signaling technology. 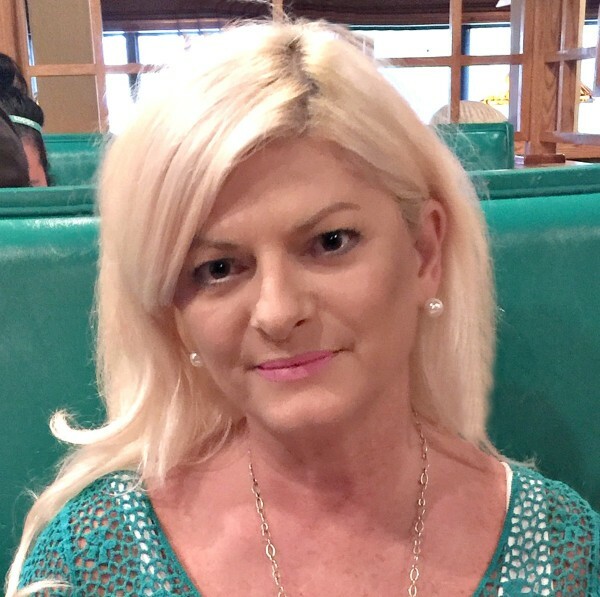 I started using this skin care system about a month ago and I am thrilled with the results. I can feel and see a difference in the texture of my skin. My face is smoother and I’m excited to see continued results. I’ve realized something during the past month, too, that I’d like to share with you… I am rough on my face. I exfoliate often, which is fine, but doing it too often puts a lot of physical stress on your face. You really only need to gently wash your face and neck with your hands or a soft cloth. That’s what I’ve been doing with the Gentle Refining Cleanser. I use it in the shower and gently wash my face taking care not to be rough. 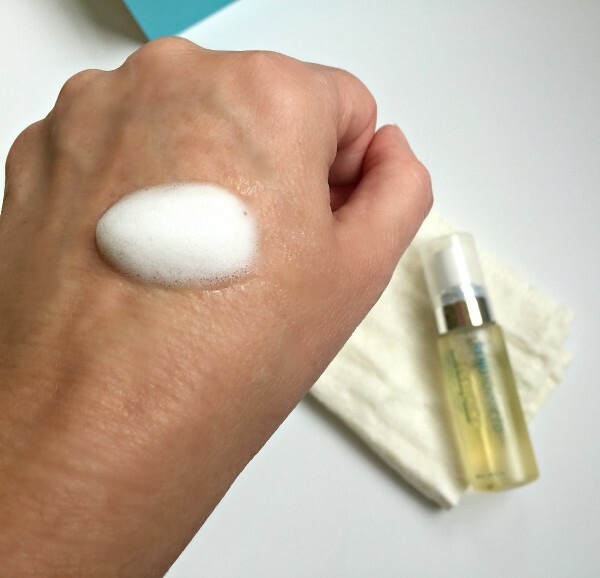 Step 1: Gently cleanse your face with your hands or a soft cloth using circular upward and outward motions. Step 2: Shake a little and then squeeze onto the back of your hand and using your fingers dab onto your face and neck. Use your ring finger or pinky finger around the sensitive areas of your eyes. You can also use RENU 28 on your entire body. 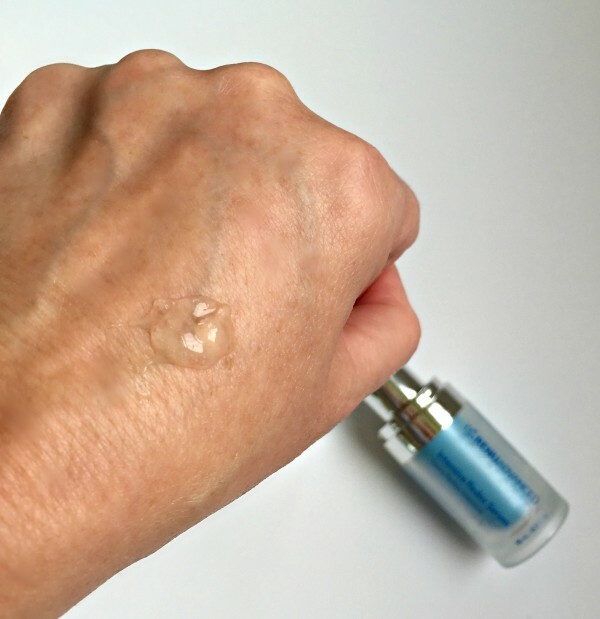 Step 3: Pump out a little (you do not need as much as I pumped out in this photo, a little does go a long way) onto the back of your hand and using our pinky finger, lightly dab/pat around your eyes and other areas where you may have fine lines, etc. Step 4: Pump a grape-sized amount of the Ultra Replenishing Moisturizer onto the back of your hand and gently apply to face and neck using upward and outward motions. Repeat all 4 steps again at night. I love the way all four of the RENU Advanced skincare products smell and how quickly they absorb into my skin. I think I would have seen much more significant results if I had been more consistent in using the products twice a day, but I usually only used them, with the exception of the Intensive Redox Serum, once a day. I’ve also only used the line of products on my face and neck, but will be trying the RENU 28 Revitalizing Redox Gel on my body, soon. If you’d like to try RENU Advanced for yourself you can order straight from the website. Keep up to date on RENU Advanced by liking them on Facebook and follow them on Twitter.